This picnic backpack holds everything you'll need for alfresco dining a deux. This sleek picnic backpack makes it easy for two to dine alfresco. The secure sling-style strap is designed for comfort during those treks to the ideal lunch location, while cleverly designed pockets hold everything you need. 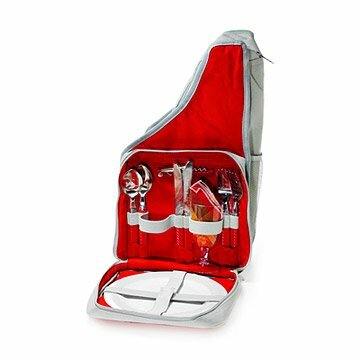 An exterior pocket secures the included complete place settings for two - plates, utensils, cups and napkins, along with a wine key - and the large interior pocket is insulated to keep your meal tasty and your wine chilled. A cell phone pocket on the strap and an outer mesh pocket provide spots to stash all other necessary items. Bon appetit! Made in China. Check out the gift lab of the Picnic Backpack on our blog! I bought a second one because I loved the first so much. This was a gift for a couple getting married in the mountains of Colorado. They are active in their lives, taking their dog with them on romantic adventures whenever they can. They were SO excited about this gift and assured me they would send pictures of the adventures they'll have together over the next few years. This is perfect for dining with elegance at a festival, in a park ,at the beach or at a concert. Best gift at the bridal shower! My friend did not have a registry for her bridal shower, so this gift was out of the norm and ended up being perfect for her! IT was a gift. They liked it. Great for spring or summer time impromptu get away. Run away to the beach after work or set on the lawn of an out door show and bring what you need. This was a gift for a couple who enjoys hiking. They loved the gift. It was perfect!